Borescopes have a multitude of uses. From manufacturing to turbine maintenance to underground pipe inspections – even medicine – they have become an invaluable tool across a wide range of industries. 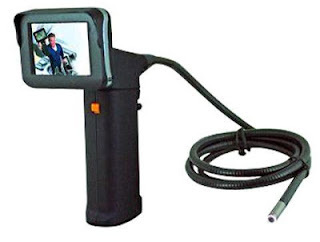 A borescope is an optical device consisting of a rigid or flexible tube with a lens or miniature video camera on the end that is used to visually inspect objects that are not accessible for direct viewing. Rigid borescopes are the most widely used and cost less than flexible devices, but viewing is restricted to a straight line. Flexible borescopes include a bundle of optical fibers that allow access to cavities and around corners. To meet the wide range of needs required by such diverse industries as aerospace, weaponry, and power generation, borescopes come in a variety of diameters and lengths, and can be customized for different viewing angles and environments. Borescopes are widely used in the construction industry to inspect ductwork, wall cavities, piping, conduit, tanks, and more. In R. Baker & Son’s line of work – rigging, dismantling, and demolition – they provide data on the structural features and integrity of a building, detect damage in underground piping, and identify ductwork problems such as tears or collapses. They’re also used to trace the layout and origin of lines and piping, examine their condition, and locate lost or previously unknown underground tanks and vessels. Contractors who frequently use borescopes (plumbers, HVAC) often purchase or rent equipment, while others use professional borescope inspection services. With sophisticated borescope equipment and highly trained technicians, these companies are equipped to handle challenging inspections of just about any kind, and some offer repair, washing, and retrieval services as well.